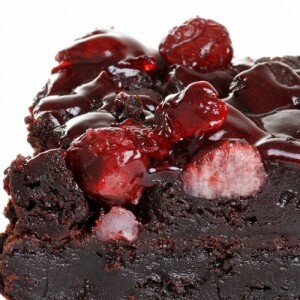 A recipe for a Cranberry Brownie that offers a little Zing. Grease a 9 x 13 inch baking pan. Melt 1 cup butter in large saucepan. Remove from heat. Stir in 1 cup cocoa powder. Add 2 cups sugar, eggs, vanilla extract, and 1 teaspoons almond extract; stir until well blended. Stir chocolate mixture into flour mixture. Add cranberries and mix just until blended. Bake 30 to 35 minutes. Cool completely and glaze. Place all the ingredients into a saucepan and cook on medium high heat for about 20 minutes, or until most of the liquid is reduced. Stir occasionally. You will hear the cranberries popping which is what they do. Remove from heat and refrigerate. You will want the glaze cooled before applying to your brownies.